My all time favorite soup recipe! 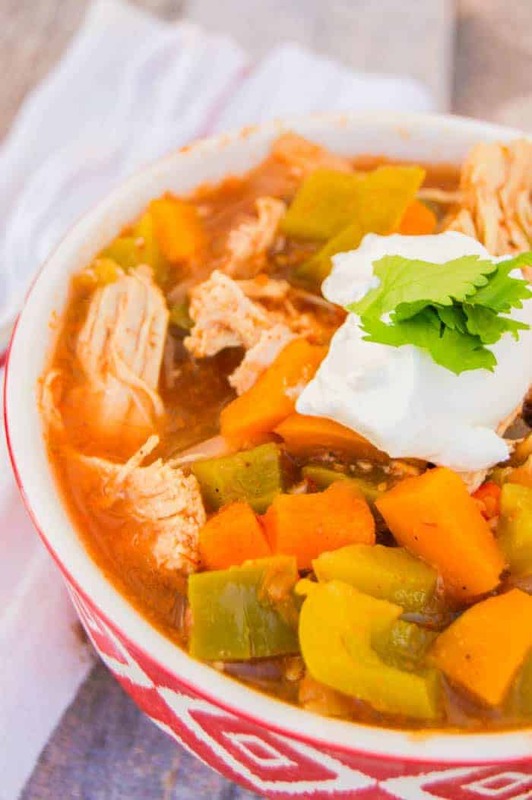 This Slow Cooker Chicken Fajita Soup is so simple to make and full of flavor. Slow cooker recipes are my favorite! 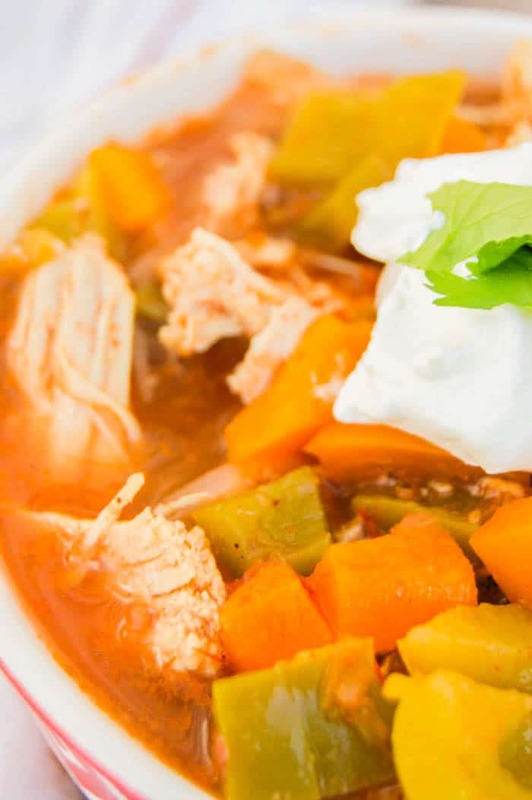 Just dump all your ingredients in and a few hours later you have the perfect chicken fajita soup! I’m a big soup lover! I always have been. My favorite thing to do is to make it at the beginning of the week, and divide it up into servings for homemade soup for lunch each day. I love to top mine with tortilla chips and sour cream. 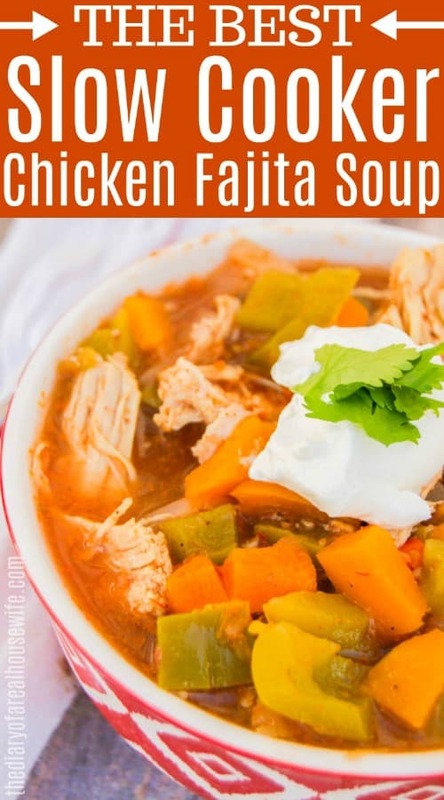 If you love this soup then make sure to check out even more of my favorite chicken fajita recipes next. Step one: Start by dumping all your ingredients into the slow cooker, I diced up three bell peppers orange, yellow, and green but any color will work. Step two: Then a diced onion, corn, salsa, and chicken breast all in chicken broth. Step three: I add my chicken breast whole and allow it to cook. Once cooked I use a large fork to shred it. Ta-da, that’s all! Once cooked you can serve it with tortilla chips, shredded cheese, and sour cream. Slow Cooker Cheeseburger Soup: This simple soup recipe is made in the slow cooker and a family favorite. Beef Nacho Soup: This soup is one of my favorites, I top it with crushed tortilla chips and it tastes just like nachos! 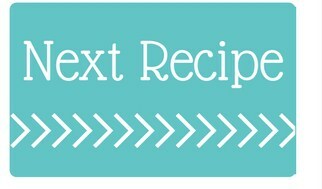 Taco Soup: My readers all time favorite and a recipe I think you need to try! Optional for topping: tortilla chips sour cream, and shredded cheese. Add all ingredients to your slow cooker. Allow to cook on high for 4-5 hours or until chicken is fully cooked. Use a fork to shred chicken. Serve and enjoy! Optional: top with tortilla chips, sour cream, or shredded cheese.